If you’re still on the lookout for your Christmas bargains then you might be able to pick one out at the Appliance & Gadgets Craze sale going on right now at the World Trade Center East Wing. A bunch of brands are in attendance including Samsung, Panasonic, Nokia, LG, Nikon, Toshiba, RedFox, Sony, and many more. It looks like whatever kind of gadget (or appliance) you’re looking for can be found there. But you have to hurry – the last day is today, December 15, 2011. 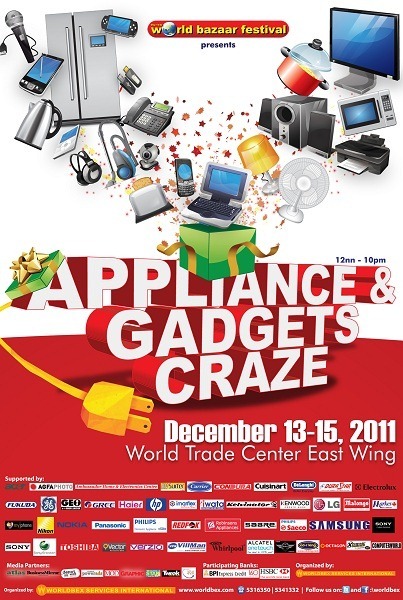 The Appliance & Gadgets Craze has been running since this Tuesday, December 13th until today, December 15th. A lot of brands are included in the list of sponsors and gadget sellers so finding the best gadgets to take home should be pretty easy – if one product doesn’t satisfy you just walk over to the next booth and you can compare them without too much hassle. Plus if you’re still looking for gift ideas, the sheer amount of tech in attendance should easily give you some inspiring presents for appreciating your loved ones. So if you’re keen, hop over to the World Trade Center’s East Wing today – and bring your money/ATM/credit card. Enjoy! The Appliance & Gadgets Craze is part of the World Bazaar Festival which runs from December 2 until December 18 this year and will have over 600 booths from the countries top retailers – both tech related and not. So you’ll actually have until the weekend to check them out for more deals!